All transactions are safe and secure with a reliable history in online purchasing behind each of our associates. Buy the CSI Badge t-shirts to own CSI clothing and merchandise. The badge CSI t-shirts shown on the left represent the forensic crime scene investigators of Las Vegas, who were originally supervised by Gil Grissom. 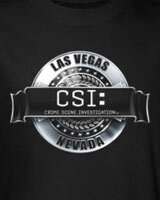 The CSI Las Vegas tee on the left features a banner style badge design that reads, "Las Vegas Crime Scene Investigation" on the front. Pair it with a CSI Miami t-shirt to represent both sides of the country. The designs on these CSI clothing items are available on a variety of apparel styles and can be worn under similar sweatshirts and long sleeve Ts. In addition to the CSI Badge tees above, browse the CSI Clothing Gallery for more apparel like men's and women's clothes, kids shirts or hoodies.